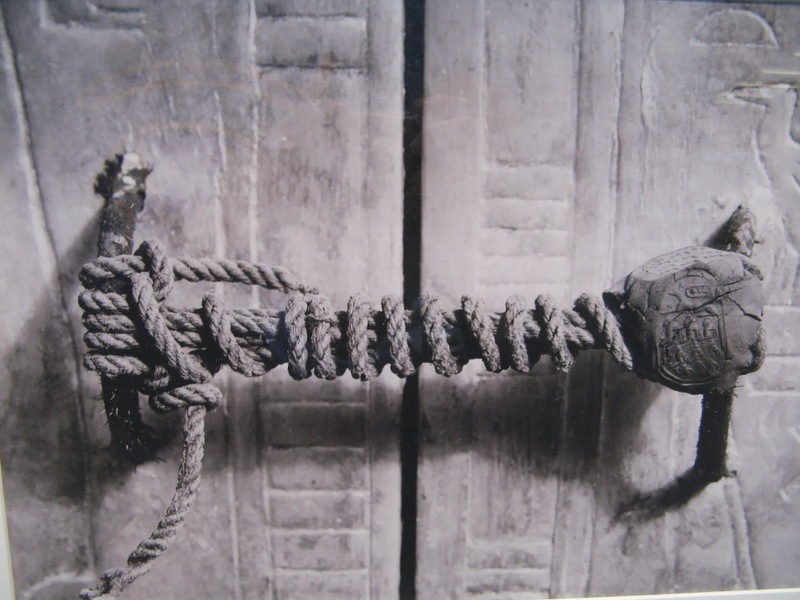 The unbroken seal on King Tutankhamun’s tomb, 1922. This seal was actually a seal to King Tut’s fifth shrine. The king was buried in a series of four sarcophagi, which were in turn kept inside a series of five shrines. This unbroken seal stayed 3,245 years untouched. The late discovery of Tut’s tomb resulted from the fact that it was covered by debris from that of Ramesses IV which was located directly above its entrance. While the outermost shrine of the youthful pharaoh had been opened not once but twice in ancient times, the doors of the second of the huge shrines of gilded wood containing the royal sarcophagus still carried the necropolis seal which indicated the pharaoh’s mummy was untouched and intact. The tomb of the boy-king was opened by the famous archaeologist and Egyptologist Howard Carter in the early 1920’s. The tomb contained treasure more spectacular than any previous discoveries. Shortly after Howard Carter removed the lid of the outermost shrine in Tutankhamun’s Burial Chamber, he discovered three more. Harry Burton photographed the ornately decorated doors of the second shrine while closed, their simple copper handles secured together tightly by a rope tied through them. The knotted cord was accompanied by a delicate clay seal featuring Anubis, the ancient Egyptians’ jackal god entrusted with the protection of the cemetery. Even at the outset, Carter and his financier, Lord Carnarvon, knew that the tomb had been compromised, because of a re-plastered and sealed hole in the outer doorway (not on the fifth shrine). Furthermore, once they had entered the tomb, the disorganized state of the material, the damage sustained by several objects and the discernible lack of solid metalwork, bedding, glass, oils and unguents all suggested that the tomb had been robbed during antiquity. The story goes that he also found an ancient clay tablet in the antechamber. When he later translated it, the inscription read: “Death will slay with his wings whoever disturbs the peace of the pharaoh”. This would later became the famous “Curse of the Pharaohs”, which in fact is just a myth. The curse, which does not differentiate between thieves and archaeologists, allegedly can cause bad luck, illness or death. Tutankhamen was a very inconsequential king while alive, however because the tomb was located under an existing tomb and grave robbers never found it, it became one of the most valuable archaeological finds. Because of its lower position in the Valley of the Kings, the tomb’s entrance was sealed by rocks and mud from flooding and the location was lost until Carter’s discovery. Tutankhamen was a relatively minor Pharaoh who seemingly died unexpectedly at a young age so whatever wealth with which he was buried (and that archeologists uncovered) was just a fraction of what it could have been, had he gone on to live a full life. So can you imagine the immense wealth that must have been buried with great Pharaohs such as Ramesses II. How did the rope last 3,200 years without deteriorating? Rope is one of the fundamental human technologies. Archaeologists have found two-ply ropes going back 28,000 years. Egypt was the first documented civilization to use specialized tools to make rope. One key to its longevity isn’t the rope itself, but the aridity of the air in the desert. It dries out and preserves things. Another key is oxygen deprivation. Tombs are sealed to the outside. Bacteria can break things down as long as they have oxygen, but then they effectively suffocate. It’s not uncommon to find rope, wooden carvings, cloth, organic dyes, etc. in Egyptian pyramids and tombs that wouldn’t have survived elsewhere in the world. Egypt’s desert conditions made possible the preservation of far more organic material than would have otherwise been the case. This in contrast to, say, Maya sites in Central America which are far younger, but from which almost no organic material has been recovered. The main difference is jungle versus desert conditions. (Photo credit: Harry Burton, Griffith Institute, Oxford, National Geographic Society). Merci infiniment pour la magnifique photo du sceau et de la corde artistiquement nouée ainsi que pour les commentaires l'accompagnant. Quid de la momie ? Whoever edits and puslbihes these articles really knows what they're doing. I wonder if that rope is also 5000 years old? It looks like a modern hemp rope to me. It's just fascinating thinking about that rope, being there for 3000 years, untouched. Just.... amazing. I wonder if it's still like tht???? Well they went in right? sooo I'm guessing they had to remove it lol. The left side of seal in picture looks like a hand with five fingers (four plus thumb).